A while ago I had nothing better to do than install my operating system on a fresh hard drive. Seemed like the best way to upgrade everything at once. Since then, I’ve been – as usual – pleasantly surprised by small changes in Linux Mint. One day I was looking in the menu for something and saw SpaceFM. WTF is that? I say to myself. I didn’t install that, did I? I click on it. Lo, the coolest file manager I’ve ever known springs forth. I survived many years of Windows thanks to Free Commander, a tabbed dual-pane file manager that let me handle my file system as if it was my own (unlike Windoze Exploder). After moving to Linux, I tried various candidates for the empty space in my heart left by the absence of FC. Suddenly it was there. Anyway, now that I was aware of it, I dove in, exploring its features, configurability, and usability. Amazing. I can’t imagine how I had never tried it out before. With a few plugins and tweaks, SpaceFM morphed into my ideal of file managers. After a bit of study, I even got my indispensable “File Memo” inserted into it. When I download something, or alter/create a file, or otherwise just want to leave some information about it that is independent of any operating system, I like to create a text file with the same name as the file in question. A file name can’t always carry enough information to tell me, a few years later, why it’s there. Nor can it give a link to an author’s website, if that can’t otherwise be found. 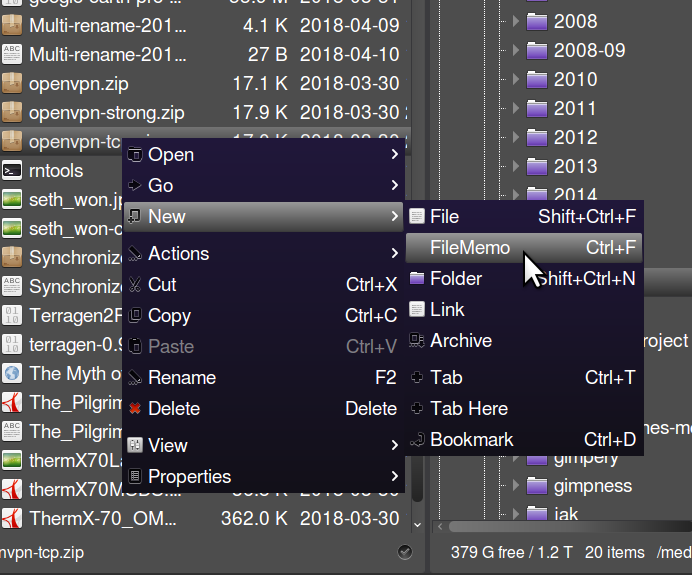 Long ago, I had a downloaded context menu add-on that did it for me. Times changed and I had to make my own; first a compiled script for Windows, then a Linux version that worked in the default file manager. Now, for SpaceFM, I have created the third incarnation of the file memo. Here it is, handily exported as a plugin. It only uses one short line of code. I put mine in the “New” context submenu, but as you like it is the only law.